Colin Baker is to be congratulated for assembling such a vast array of memoirs, anecdotes and longer accounts of expatriate experiences in colonial Nyasaland. I found the book a fascinating and absorbing read. Most importantly I see it as a unique and important historical record with a huge amount of detail on what life was really like for the people who lived there. Besides giving the reader a picture of the great variety of work it also paints a picture of the vast kaleidoscope of expatriate attitudes; towards the local people for instance. All this will give future historians insights which otherwise they could never hope to achieve. The net effect will make it difficult for future academics or media people to put over stereotypes based on the misguided current political correctness. As someone with a lifetime's experience of the region as a whole, I found it particularly interesting to read about how the imposition of the federation with Northern and Southern Rhodesia in 1953 affected life in Nyasaland much more than in the other two countries it seems. Whatever the politics, the links between the three have always been there and this Is illustrated by the accounts of travel through the region of people arriving on first appointments, travelling on holiday or going backwards and forwards to school in Southern Rhodesia. Many were the adventurers descending into the Shire valley, crossing the Zambezi by train and travelling through Mozambique. Most people who lived in the other territories had only heard about the beauty of Nyasaland, its towering Mlanje Mountain with its cedar trees, the superb beaches and delicious chomba fish of Lake Nyasa, the charm of Zomba and the mighty plateau that towers above it, and the remote, unique and magical Nyika Plateau. Now this marvellous book brings them all to life. It will do much to persuade more people to visit Malawi to see these wonders for themselves. What an achievement! Colin Baker deserves great thanks and congratulations for another magnum opus of putting together such a lively and comprehensive picture of what life was like in Nyasaland in the colonial period. It goes a surprisingly long way back in showing a happy country where people got on with each other and worked constructively and with great commitment. For historians and anybody seeking the truth about life in those days it will be hugely valuable. I looked in vain for signs of antipathy between the races including patronisation even during the difficult days following the imposition of Federation and I particularly liked Bob Keppel-Compton's tribute to the machila men. It reminds me of all the recognition and thanks due to other groups in the colonial era such as the wonderful District Messengers of Northern Rhodesia. Of course the quality of the contributions varies enormously. I found those from the former administrative officers and policemen particularly interesting. But there are fascinating snippits everywhere. Most absorbing were the stories of so many members of the Bishop family over the generations. More than anyone they deserve collectively to be thought of as British Malawians. Other fascinating insights for me include the role of Chinde on the Zambezi as a sort of offshore Nyasaland enclave. Another was the emergence of the old capital Zomba as a place of real character which somehow combined stability, beauty and fun. I wish I had had the chance to get to know it better. Once again Colin Baker is to be congratulated on a great labour of love. How on earth did he manage to persuade so many people, from so many walks of life, to write about their experiences? What he achieved says a lot about him and about the influence Nyasaland/Malawi seems to have had on practically everyone who has been there. They in particular will enjoy reading this book and learn a lot about their former colleagues and forebears. One of my reactions as a lover of all three territories of the former Federation is to regret that we have no comparable historian to chronicle the quirks, deeds, achievements etc. of some of the great characters of Northern Rhodesia. We too had all sorts of people with particular interests, talents, even bees in their bonnets, from compost to cannibalism. There were people like Errol Button who built the mountain rest house at 8000 feet in Nyika right on the border with Nyasaland. I see much of the value of Colin Baker's volumes lying in the fact that they throw so much light on an era which in the interests of perspective and truth needs to be understood by future generations of Malawians whose fellow Africans sometimes see their history as starting with independence. This third volume certainly provides a wealth of insights. Those that interest me most were some particularly interesting bits of writing about the preoccupations of former administrators. Their attitudes and interests compare closely with those of their colleagues ex-Northern Rhodesia. In particular, the culture of mutual respect comes over and explains some strong reactions from many of us to the ill-informed distortions of journalists and academics which have been responsible for the negative public attitudes towards the colonial period. Many people will remember the British news reports of supposed brutal behaviour of the police in quelling a riot during the visit of a British politician to Nyasaland. This resulted in a Commission led by Mr Justice Southworth who commented famously that 'not a mustard-spoonful of blood had been spilt'. In this volume I also found the experiences of the hunters, the nurses, the naturalists and the military as having been particularly vividly described. There is also much more of potential interest to lovers of Africa and to historians. Not surprisingly and to balance this there are some rather indifferent pieces with irrelevant detail and a plethora of names. Overall however, this third volume provides the reader with a wealth of varied new insights into interesting and happy times which are looked back on by people who virtually without exception loved the country and its people. My own involvement with Nyasaland/Malawi over more than 50 years has included witnessing the quick-learning locals gaining the benefit of help and training given in all fields of activity by volunteers from the British Executive Service Overseas (BESO). Less impressive have been the dozens of vehicles with the name of this or that NGO emblazoned on their sides, competing for kudos while buzzing around Blantyre. In all three volumes, I have particularly enjoyed reading about places I have been to, like the lake, Liwonde and the Zomba Plateau. I would love to have read more about one of my favourite places in the world, the Nyika Plateau, but you can't have everything. 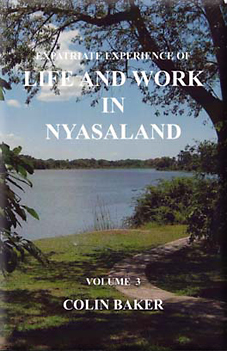 This is the fourth volume of Colin Baker's series on the experience of expatriates living and working in Nyasaland, and they simply get better as he goes on. Colin combines his expertise as a professional modern historian with his undoubted powers of persuasion to produce an amazingly eclectic collection of reminiscences. The expatriates are from a range of countries, chiefly British, Greek, Italian and South African. Between them they have an enormous range of expertise and skills. So we have the Government officials, mostly British; the various entrepreneurs who brought their expertise and skills with them to set up businesses in engineering, transport, farming and fishing; the missionaries who not only propagated their various faiths, but also set up schools, medical centres and craft workshops; and the military who, as well as their peace-keeping duties, played a part in both world wars. We also have accounts from various people who were children at the time of their upbringing in Nyasaland, stories of school, leisure activities, and sometimes encounters with wild animals and snakes. We also have accounts from a number of expatriate women, some recruited to take up employment, some who set up various businesses, and others, very often unpaid, who not only brought up their children, but often taught them as well, trained their household staff and taught them English, created beautiful gardens from virgin bush, and very often started simple first-aid stations or sewing classes for the benefit of the local population. Many of these women lived in very primitive surroundings - no running water or sanitation, no electricity, a thunderbox lavatory situated outside the house, no easy communication with the outside world. One of the most fascinating chapters in the book is where Colin describes the adventures of three women travellers who, separately, in the first decade of the Twentieth Century, passed through Nyasaland in their exploration of Africa. These women, born in the Victorian era, organised their own expeditions, and travelled in very primitive conditions, very often hitching lifts on various kinds of transport. One, indeed, was the first woman to travel the length of Africa, from the Cape to Cairo, taking in Nyasaland en route. Also included are descriptions of the 'outside-work' aspects of life. These include balls where people would dress formally, and the Police Band would often play. There would also be formal dinner parties, with the best linen, china and silver. There are heart-warming accounts of expatriate weddings, where the bride, newly arrived in the country, would be supported by members of the community, all anxious to make up to her for her own family not being there, by providing the flowers, the dress, the reception. There are also accounts of people's sports activities, from golf and swimming at the club, organised games such as football and cricket, to hunting expeditions and fishing trips. Colin sets the background to this kaleidoscope of reminiscences by describing the form and structure of government. It is important to realise that, right up to independence in 1964, when it became Malawi, Nyasaland was a Protectorate, and ours was a mentoring role. One thing that shines through in many of the stories is the warmth and affection which, with few exceptions, existed between the different races, One can understand why the modern tourist trade refers to Malawi as "the warm heart of Africa". For those who do not know this country, I can recommend this volume as a fascinating introduction to a small but beautiful land and its hardworking people. For those who shared that special time and place, this will be a nostalgic trip to their past, and an experience which will certainly have influenced the rest of their lives. When asked to review Volumes 5 and 6 of Colin Baker's magnum opus I suggested I might take on an overall review of the whole set of six volumes, a suggestion which was accepted. It proved to be a challenging but enjoyable task. Let us begin with the two newly-published volumes. Readers of this journal will be familiar with the layout of the work: a series of contributions, mostly written on request, grouped under headings. Four new topics appear for the first time in Vol. 5 - Amateur Dramatics, Business and Trade, Gardening, and Needlework; and three further ones in Vol. 6 - Prisons, Reading and Literature,and, interestingly in this most recent one, "Why go to Nyasaland?" These two volumes continue the collection of reminiscences found in the first four books, and I can recycle a few quotations from previous reviews of these. They contain unalloyed praise. "I see it as a unique and important historical record of what life was really like"; "For historians and anybody seeking the truth about life in those days it will be hugely valuable"; and, "How on earth did [Colin Baker] manage to persuade so many people...to write about their experiences?" (Jonathan Lawley, reviews of Vols. 1 and 3 respectively). With respect to the two new volumes, I cannot do more than echo these sentiments. Now to the work as a whole. To appreciate what has been achieved one needs to start with some statistics. The six volumes total some 1920 pages, containing 640 contributions (as the author calls them) from about 450 different people. Colin himself contributes accounts, often more than one, to every volume. The individual accounts are grouped under 42 headings, ranging alphabetically from Administration (in all six volumes) to Women-Life and Work (four of them). As might be expected, the second most common heading is Families and Childhood, the 'Life' side of experiences. Naturally 'Travelling and Ulendo' (Safari) features prominently. Colin writes that his account covers the 75 years of British service in the country, but a high proportion of the accounts cover 1930 to independence in 1964. Most contributors are British, but Greeks, Italians, South Africans and other nationalities add to the variety of experiences covered. Supporting the text are photographs, numbering about 400, mostly in black and white, although a welcome innovation in Vol.6 is that some are in colour. These add greatly to the feel of the time and place: cars stuck on roads or in rivers, ladies smartly dressed (and men in uniforms) for occasions such as the King's/Queen's Birthday Parade. A few show early pioneers, and governors, and there are many of families. Can one gain, from assembling all contributions, an overview of the achievements of different branches of the colonial service? No, and this is not the intention. There are some longer individual accounts which hint at this, for example a 9-page account of Geological Survey in Vol. 1, and the six on Nursing, two of over ten pages, in Vol. 3. But contributors have rightly concentrated on what they think will interest readers, the exciting, bizarre, happy and occasionally sad events which they experienced. In my own contribution I devoted only one page to 'Work' (a soil survey of the country) and four times as much to why I went, the journey out and back, a brief secondment to the Police during the Emergency, and leisure - this last including an invitation to a pyjama party by one of the District Commissioners. Many accounts have a similar balance, others cover only a leisure activity - sport, fishing, hunting, amateur dramatics, the list is long. Notable is the story of the Mlanje Mountain Club (Vol. 1). The photographs are still more heavily orientated towards families, children and leisure. In four volumes one finds the headings 'Government Officials'. This is curious first, because that covers all civil servants; and secondly, because under this heading are to be found additional items on Agriculture, Forestry and Police, and these are the only places to find Architecture, Audit and Survey. My main comment is about the absence of indexes. Most readers will wish to seek one of three types of item: articles by former friends, or on places they knew, on their own branch of work (education, customs service, police, military, etc.) or a type of interest such as natural history. It is a matter of regret that an index was not set up in the first volume and maintained subsequently in a cumulative manner. True, this robs readers of the fun of discovering what they seek for themselves, but to do so they would need to possess the full set of volumes. So is this collection unique? Such a claim is based on Nyasaland being a relatively small country, with memories largely spanning a period of 35 years. An overall account was given by Frank Debenham in Nyasaland: the land of the lake (1955), but with an emphasis on the land and its local people, and only a chapter. The Bwana DCs, on the civil servants. There are many books of collected colonial reminiscences, notably Plain tales from the Raj (1975) and Tales from the dark continent (1979). In the OSPA jubilee volume I remember it well (2010) David le Breton was able to make an eclectic selection from 50 years of The Overseas Pensioner, choosing 72 articles covering 25 occupations and 19 territories. Nyasaland was a wonderful country, with a mild tropical climate and spectacular range of landscapes. Overseas civil servants went there (by ship until 1962) for tours of three years with nothing like the outside contacts that there are today: no telephone, only airmail letters and the BBC overseas service. In my experience they were invariably dedicated to meeting the requirements of their jobs, often under testing circumstances. I gladly agree with the words above in Patricia Clayton's review of Volume 4 when she said: "One thing that shines through in many of the stories is the warmth and affection which, with few exceptions, existed between the different races." Readers may put me right, but I doubt if such a large collection of reminiscences about one country has been equalled. Colin has triumphantly achieved what he set out to do six years ago, to provide an historical record of the feel of Nyasaiand in the period, what it was like to be there.